Hogmanay festivities: Scottish New Year Celebration in Stonehaven are really something special, because of the unique tradition of the Stonehaven Fireballs Ceremony. As the Old Town House bell sounds to mark the new year, volunteers set the balls ablaze and start walking down the High Street, swinging huge balls of fire around their heads at the ends of chains. Large crowds flock to see the amazing display. After the ceremony, any fireballs that are still burning are cast into the sea. As you wait for midnight you will get to enjoy pipe bands, street drumming, fireworks, fire poi, and much more in a warm and friendly atmosphere! Stonehaven beach: regardless of the weather or the time of year, visiting Stonehaven beach promises a lovely scenic walk. Enjoy the gorgeous scenery strolling along this long nice beach mixture of pebbles and sand, with large cliffs at both ends sheltering small rock pools and coves. The path will take you past fascinating historic houses to the harbour. Look out for the beautiful wire sculptures along the way, depicting town’s fishing industry. Dunnottar Woods: situated close to the center of Stonehaven, this is a lovely area for walks. The ancient woods will take you back in time and transport you to a whole other fairy world. You will enjoy exploring many points of interest scattered around the area, walking along little streams, meandering the trails, with a map in your hand, looking for the walls of Lady Kennedy’s House, Lady Kennedy’s Bath, The Shell Hoosie (Shell House), the Gallows Hill and Ice House. This is a great way to spend some family time in nature! Stonehaven War Memorial: if you are interested in history, you will love this lonely monument high on the Black Hill, above the city. This touching, unique, octagonal memorial was designed by a local architect John Ellis honouring the town’s war dead. If you are up for a challenge you can even walk to it, up a steep path from the town centre. 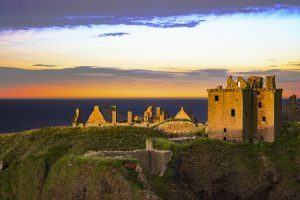 When you reach the top, you will be rewarded with one of the most stunning views in the entire area, surrounded by epic scenery of rugged coastline and a remarkable view of Stonehaven and Dunnottar Castle. Stonehaven Clock Tower: located in the Old Town near the harbour, this tower was erected in 1790, rising through 4 floors and terminating with a lead-clad spire. Inside is a museum which explains the history of the Clock Tower, as well as the local Fireballs Ceremony.